I finally finished reading Sprint, a book published by the Google Venture designers Jake Knapp, John Zeratsky and Braden Kowitz. I knew about design sprints, and have had the chance to participate in a few, including one with Jake himself. The process works great if you have the right number of people that are excited about the endeavor of a week of intense and gratifying work. 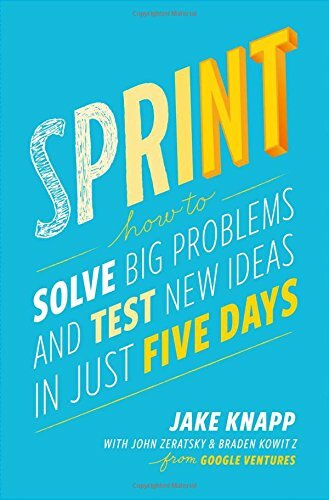 Their book, titled Sprint: How to Solve Big Problems and Test New Ideas in Just Five Days gives all the details and story behind how they came up with and perfected the design sprint. It's a must read for designers willing to improve their skills on problem solving and the design process in general. Read this book and do what it says if you want to build better products faster." The key to success, often, is building the right habits. But which habits work best? Sprint offers powerful methods for hatching ideas, solving problems, testing solutions—and finding those small, correct habits that make all the right behaviors fall in place."